HP refreshed its Pavilion laptops and X360 2-in-1s with new processors and also is offering optional discrete GPUs with the new PCs. You'll be able to select AMD Radeon or Nvidia 940MX graphics when configuring the PCs. Intel or AMD chips (but not Ryzen) can be selected with the PCs. HP realizes entry-level gaming is becoming a basic prerequisite for many laptop users, and discrete GPUs will provide serious graphics punch that integrated graphics can't match. The Pavilion x360 is primarily a laptop but can be used a tablet after you fold the screen. Prices for an entry-level 11.6-inch model, which has only a 720p screen option, will start at US$399.99 with a Pentium N4200 processor, but it can be upgraded to Intel Core i3 or i5 processors. The 14-inch model with Core i3 starts at $499.99, while the 15.6-inch model with Core i5 starts at $699.99. The 14- and 15-inch models can be upgraded to full HD screens. The 14-inch model with Core i3 starts at $499.99, while the 15.6-inch model with Core i5 starts at $699.99. The 14- and 15-inch models can be upgraded to full HD screens. The optional Nvidia GeForce MX940 GPU is available only in the 14-inch model, while AMD's Radeon 530 is available on the 15.6-inch device. The Pavilion X360 offers up to 12 hours of battery life, according to HP. It will support up to 16GB of DDR4 memory and up to a 1TB hard drive or 512GB SSD storage per slot. The 2-in-1 devices have one USB Type-C port and two USB 3.1 ports. HP touted the X360 as being ideal for note taking, with a stylus included. It also has 802.11ac by default. HP touted the X360 as being ideal for note taking, with a stylus included. It also has 802.11ac networking by default. The conventional Pavilion laptops also come with optional AMD Radeon or Nvidia 940MX GPUs. The 14- and 15.6-inch laptops come with Intel or AMD chips, while the 17.3-inch can be configured only with AMD's A10 or A12 chips. The PCs start at about $529.99. The new laptops are 12 percent thinner than predecessors that shipped last year, measuring 19.9 millimeters thick. HP cut the optical drive option from the laptops, which slim it down. The laptops are also lighter and charge much faster. The devices support up to 16GB of DDR4 memory and also have USB Type-C and HDMI ports. Also included is a media card reader and 802.11ac Wi-Fi. 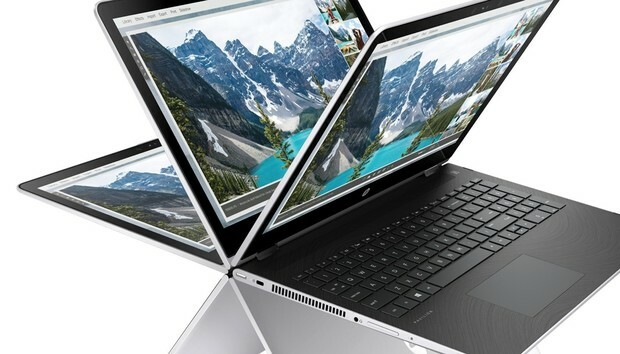 The new PCs will be available worldwide in May or June through retailers and HP's website.